When the news of HTC’s new HTC Touch Viva leaked, the part most difficult to believe was that it would come with TouchFlo3D, given its rather meager 200 Mhz processor. It turns out HTC anticipated this, and made a less processor intensive but still stylish version called TouchFlo 2D. It features most of the enhancements of TouchFlo 3D, as can be seen from the video below. As usual, the busy people at XDA-Developers have liberated the software from the Viva ROM and made it available for all of HTC’s other phones. The software is now available for download from this XDA-Developers thead. Its not perfect yet,but its pretty close, and will certainly make users of current generation devices not feel completely obsoleted. Kushiel came up with the fix to run M2D on a certain device. Fortunately, It works on most non HTC device either. all credits should go to him and pls. thank him if U see him for this great fix. arigold1 of XDA and PPCGEEKS came up with this tip so I would like to give him credit for learning that it works for most non HTC devices. give him thanks as well. Manilla 2d Now working on non-HTC devices! Cab Download: This is the Updated version as of Dec 1. The UI is still under development so pls. stay tuned. Vet and his crew is cooking something really HOT! Trust me. UDK, Noonski, Ervius, Gullum, L26, VetVito and everyone else! this download is only the manila2d file only. The other files you should have already from other downloads. this is an older manila 2d update version. the most current build is in version 20. The elfin build is found here. and with the help of many who beat me to the creation of a beta cab (you know who you are). NoteTo get YouTube to work you must install this .cab below Note: it's not 100% working as of now. try it, might work with ur device as some claimed. A lot of claims that the videos are playing on nfsfan,whosdaman and most ROM based on no2chem . customizer for M2D with this awesome app. ADD tabs or move it around easily. follow the link below.A very Special Thanks to mpenguin14 for this amazing app. Go to the link below If ur missing files or wanna download the older versions. Manilla2D (M2D) Disables any and all other Homescreen Plugins, just so you know. If Weather Graphics are missing, you are still using an older test Cab without all the graphics. If you still can't select a city after installing the Audiomanager, You are missing a HH_0409_WeatherCities.xml in your Windows Folder. Re: Touchflo3d on HTC Touch Cruise. The skin section have been moved to a new home. It has it's own thread now. Thanks for jdume for helping out and Also our skinning krew goddbody and wamu93. U guys are awesome! click the link for the official skinning thread. Just did a small work of passing some files to grayscale. Copy all the files in the zip to \Windows and re-install the original CAB to have the blue version back, enjoy. Thread: http://forum.xda-developers.com/show....php?p=2636185 Thanks twolf. this is awesome! keep it coming! ADD glossy black bars on it and were good to go! 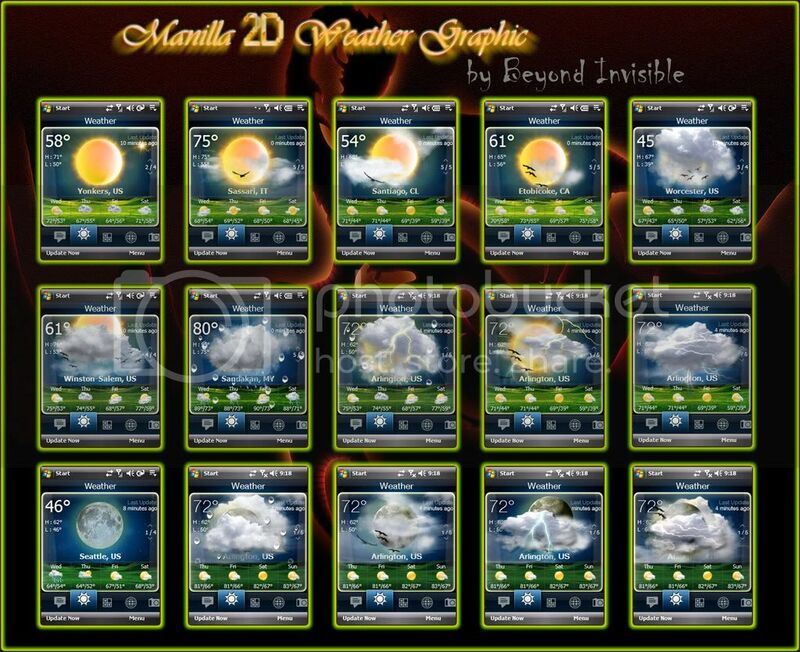 Custom M2D weather graphics created by BeyondInvisible of XDA. Special thanks to emeraldayotte for looking up. Download below. These weather graphics only work with Manilla 2D. This installation file won't work for SPB Mobile Shell. 1. Download this file below from Megaupload. 6. Enjoy the new weather graphics. If you like my works, please consider to donate. It'll be much appreciated. This awesome dialer is made by pauldgroot of XDA. Here it is, the release of my TouchFLO 2D dialer skin. Letter preview and another landscape preview. 2. Copy cab to phone and install. Finally with help from signal34 and thormdac I have released two addons for Smartdialing and redialing. PdG Redial Enabler.cab is only redial. PdG Smartdial Enabler.cab is redial and smartdial. First install one of the dialer cabs and then install one of the addon cabs. To revert back to the original state first uninstall the addon and then reinstall the dialer. CABS for Redial and Smartdial. PdG Redial Enabler.cab ---> here. PdG Smartdial Enabler.cab > here. I also see my work is being published on other (warez)sites. I am ok with that but please give me a notice before posting it on your website. I would love to see some donations. I notice a lot of my work is being downloaded over a couple of thousand times and I have only recieved about five or six donations. So if you want my work to remain free, please consider a donations. This is not because I want to earn money here but if you could spare a few bucks you will encourage me to make more skins and publish them here on XDA. Credit goed out to andradenation, he gave me a concept wich I worked out! Re: Touchflo3d Now on cab. Get it here!!! Tips and tricks gathered from our tipsters. Note: May or may not work. Try and see for Yourself. Remember to backup necessary files. Anymore tips pls. feel free to share. Thanks for all ur tips and hack guys. Thanks to XDA especially vet and his crew that I forgot to mention for this amazing leap for the PPC Commnity. If youtube app does not work for U, Try this alternative. It's not as pretty as the diamond youtube but it works. thanks to hellraiser_osu for this.be sure to back up ur files and entries. That will launch the Youtubeplay app. In order for the opera browser to work, U should copy the .exe and .lnk to windows root directory. Thanks to wytecaztle for the tip. Use sktools. Some say there is a 7 day trial. HTC album video fix: Thanks to bootheresa for the heads up! after U made the skyfire shortcut, rename it to VJTarget.lnk and put it on windows folder. Go to M2D internet tab and launch the browser. U'll be surprised it's skyfire. Add more programs/links to internet page: Thanks to Videonut for this tip. Want to add a program like Internet Explorer under the Youtube Icon on the Internet Page? .... add string "CustomizedTitle" value= "Internet Explorer"
you can point to a URL instead of a program. The String "CustomizedDescription" with text for the value doesn't seem to work. I imagined it would show a popup of sorts when the icon was held but nothing. Below is known fixes for known problems. U might wanna check it out for ur issues. These fixes came from XDA official m2d thread. How is the flat black start bar, and soft key bar obtained? No matter what I do I always get that gradient on them which doesn't fit with this plug-in at all. Any thoughts on why I'm losing my contact favorites on a soft reset? Which youtube app do U have? the diamond youtube app? let me know if you want/need anymore pics...enjoy! Hey not sure if someone has done this yet but I skinned the digital clock black, and I will be putting up a White theme as well. "can you share your tsk? edit:nevermind im a douche....was just scrolling through the album and found it!"